As the inevitable adoption of cloud services continue to grow, it is important to ensure best practice approach is taken to embrace an area that has not only been in existence for a long time but here to stay. 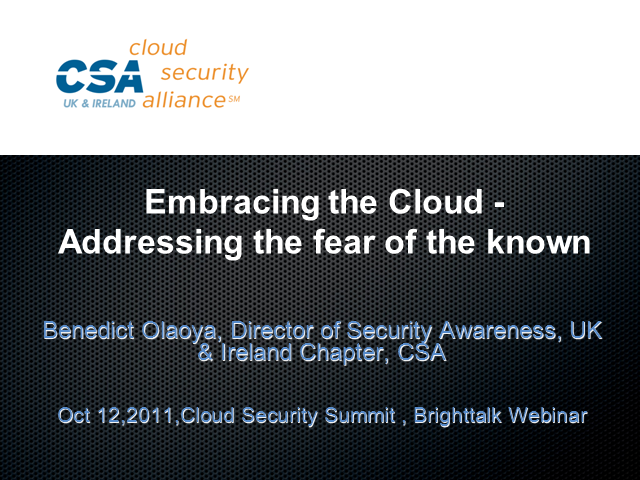 Benedict Olaoya is the Director of Security Awareness for Cloud Security Alliance UK & Ireland Chapter. He has several years of experience in the information Security, Risk, Governance and Compliance industry and has held various roles providing consultancy services both in the public and private sector. He is also currently a domain lead in a global initiative for providing a framework to attest Information assurance maturity for third party providers/supplier called Common Assurance Maturity Model (CAMM).